Comfort food on the Whole 30 Diet? You bet! 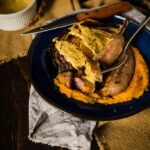 And this Sausage with Roasted Cabbage and Butternut Squash Puree is the perfect recipe to prove that eating cozy can also be healthy and delicious. Fresh Thyme or Caraway seeds for garnish. Slice the cabbage into wedges. Arrange in the center of a large foil lined baking tray. Core, remove seeds and cut the butternut squash in half. Arrange on either side of the cabbage. Drizzle olive oil over the cabbage and squash. Sprinkle with salt. Bake for 20 minutes; Flip the cabbage, nestle the sausages into the pan and roast for 20 minutes longer. Meanwhile, whisk the mustard, mayo, coconut aminos, salt and pepper, with the melted ghee in a small bowl to make the sauce. Carefully scoop the roasted squash from the skin and puree with ghee. Serve the cabbage wedges and sausages over the butternut squash with a drizzle of the mustard sauce and fresh thyme or toasted caraway seeds.